Taken with Olympus E500 digital camera on May 15th 2007. Click image for larger view. This is one of the most amazing sights I have ever seen! I hope I have managed to recreate a small percentage of natures beauty in this shot. The time was 11:30PM in the evening and whole sky and sea was red. When you see sights like this you take way too many shots. Afterwards it is really hard to decide on which picture to show. Will be away for some time so the blog will be not be updated so frequently in the next couple of weeks, but will try to post some photos. What an amazing shot. How lucky you are to be surrounded by so much beauty. I’m going to look around at the rest of your photos. Muito linda a foto, o por-do-sol Ã© sempre Ã meia-noite aÃ­? That colour really is quite intense! What an amazing capture. And there are so many other places who claime to have THE BEST sunsets ever. 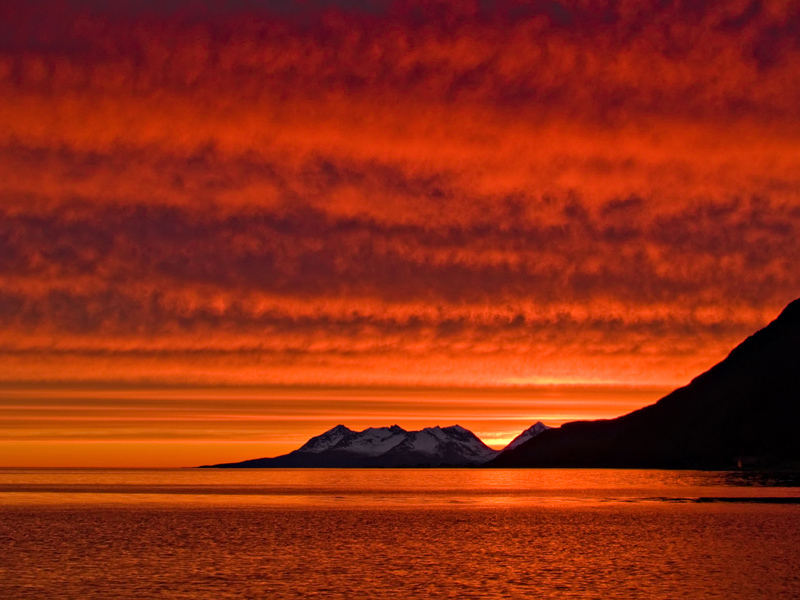 They all have NO IDEA where the REAL breathtaking sunsets happen: up there in northern Norway! I love and enjoy your wonderful work every day! This is my favorite photo you’ve ever taken. Absolutely flawless. I look forward to reading you every day. It looks like another planet! (no,I never been in another different world!heeheheh)..but it seems! I have a new photoblog up at http://fotografiker.se where I post photos taken with my new camera. Check it out! I just love sunsets. You took a beautiful shot. Just looking through the blog catalog and came across yours, i am glad i stopped by the sunset and the other pictures are amazing. I am going to add your link to mine so other people can see your images. Amazing shot. It must have been surreal in person. Wow! It takes a lot to impress me – this shot is stunning. Is this type of sunset a regular occurence or was this a one off? PErfect! you’re a pro! I’m amazed by your photos!! Oh wow, this is a lovely shot! Beautiful doesn’t seem enough to describe it .. great work. Didn’t come for a while, have another a lot of and beautiful photograph again. I love the sunset,it’s an amazing pic. This is an amazing photo! Very beautiful and the contrast between sky and sea and then the dark outline of the land is wonderful. Another beautiful pic. If you would allow me, I would love to use one (or more) of your images as headers for my travel blog. Please email me if you are agreeable to this. that is truly one of the most amazing, beautiful sights i have ever seen! Very intense colours and wow! the clouds! Wow! What an amazing colour — and so late in the evening!! 11.30 in the night is pitch dark here in India. :). And wow!! what a sight!! If you are saying this is just a percentage of the original I would love to take a look at it in person. Btw, can I use this as my desktop?? Great, warming image and such a deep red. Great flower smelling stuff – love your work! The best word that I can think of to describe your photos, and this one in particular, is GLORIOUS. I found you through your joining of Authority Blogger Forum. hi i really like this photo and i wondered if you have copyright on this photo, if you do please may you allow me to digitally edit it and use it in my Ict yr 11 Coursework. here is the website of the course we are doing if you want to check. please may you e-mail me soon, thankyou. hi, I have never seen this eye capturing picture in my life before.You are so lucky that u been there & you have done a great job. Thank u for loading this picture here.Thanks for sharing this experience.